Chicago (April 12, 2018) – Today, Senator John Thune (R-SD) announced that the U.S. Senate’s Republican leadership is bringing S. 1129, the Coast Guard Authorization Act of 2017, to the floor for a vote next week. 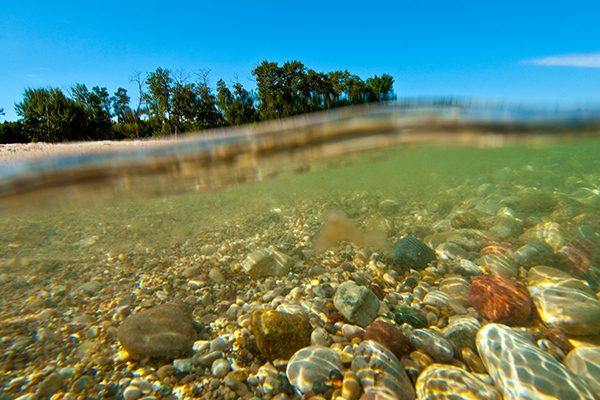 Unfortunately, the legislation contains an amendment — the Vessel Incidental Discharge Act (VIDA) — that would weaken rules that protect the Great Lakes from invasive species, putting the lakes at risk. “It took two acts of Congress, a lawsuit, and states passing their own rules to get federal requirements for actual ballast water treatment systems onboard ships in place in 2008. Yet the shipping industry continues to fight these regulations, pushing for the Vessel Incidental Discharge Act year after year in Congress. Aquatic invasive species, brought in primarily via the ballast tanks of ocean-going ships, have caused irreparable harm to the Great Lakes ecosystem and cost the region billions of dollars since the late 1980s. To improve balance and stability, ships take in or discharge water in their ballast tanks when cargo is loaded or unloaded. In doing so, they also take in all kinds of live critters that, when discharged somewhere else, can pose a serious threat to native species and ecosystems. Invasive species are costing the Great Lakes states more than $200 million each year already. The Vessel Incidental Discharge Act would eliminate Clean Water Act authority over ship discharges including ballast water and remove the U.S. EPA from its scientific role in deciding what standards are needed to protect waterways across the country, including the Great Lakes. It would exempt ships that operate solely on the lakes. And it would preempt states’ rights to protect their waters. Legislation to support our nation’s critical maritime and security needs should not be a place to weaken basic protections of our country’s greatest freshwater resource, the Great Lakes.